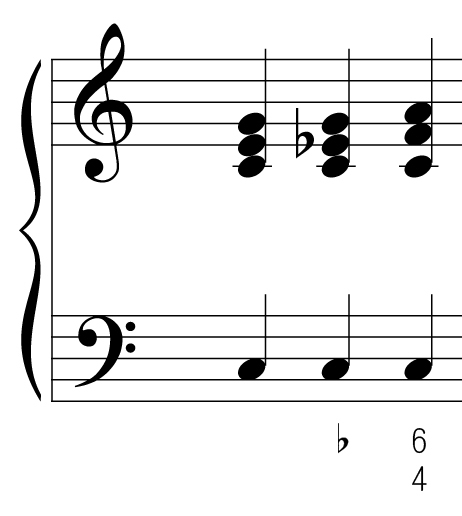 There are 3 notes usually with 4 part of voices. Besides 1 degree, 5 degree, 8 degree, it inserts a major 3 or minor 3 interval between the 1 and 5 degree so that there will be harmonics of 8, 5, 4, major 3 and minor 3 intervals in a chord. There are many types of Triads as follows. There are basic chords ( all notes in a chord are in the same scale ) and alternative chords for a certain scale. Basic chords is as follows. There are 4 notes and maybe more in a chord. 2 notes chord, i.e. root and the 5th. Multiple notes chord combined by more than 2 chords. Change the root of the chord, such as G7/B. Some chords will produce special feelings such as C7#9 is good for Blues style.